Educational standards, norms, and expectations are constantly shifting, and this perpetual evolution has radically altered the campus landscape and the buildings that support teaching, learning, and research. As a result, college campuses are left with an increasing number of outdated, abandoned, and yet arguably usable buildings. Many universities are grappling with what to do with these buildings, once bustling centers of student life and learning, which have become inadequate, inefficient, and expensive to maintain. With a responsive approach, we can capture all of the positives – the essence, character, and sentimental value – of these ailing campus facilities while also repurposing them into highly functional, flexible spaces that not only meet the wide-ranging needs of the modern student, but also are adaptable for future growth. Reuse is the most-sustainable approach to building. Materials, material transport, labor, and the concomitant energy required to build collectively make up a large carbon footprint embedded within an existing building. Reuse is a pragmatic form of recycling – far better for the environment than expending energy to demolish and then construct an all-new building. Beyond a desire for sustainability, a university might choose to repurpose an existing building rather than construct a new facility for several reasons, high among them being cost savings over new construction. Repurposing a structure is an economical alternative for universities that often face financial constraints and strict accountability. Cost was key in adapting Georgia Southern University’s Brannen Hall, a women’s dormitory constructed in 1963, into a new home for the university’s psychology department. The building’s location on GSU’s historic Sweetheart Circle ensured that the exterior scope would focus on rehabilitation, while the building’s outdated, split-level interior would focus on renovation to create offices, labs, and administration spaces. The split-level design and low ceiling heights challenged the design team to fit in engineering requirements while creating a desirable, open, and inviting space for the department. Even with these challenges, strict cost goals were achieved. Underutilized, aging campus buildings are often located at or near campus centers, providing easy access to other centralized services like student activity centers, shared spaces, and campus facilities. Unfortunately, these buildings often no longer fulfill their intended purposes. Science and research buildings and student housing facilities are particular examples of building types that suffer from this harsh reality, as the older typologies fail to meet modern safety regulations and student expectations. 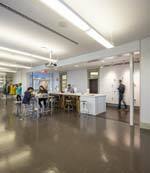 Such was the case at Agnes Scott College where we adapted a science building into a Live-Learn complex. Campbell Hall, built in 1951, no longer fit the requirements for modern science buildings, but its central campus location and Collegiate Gothic detailing made it a prime candidate for reuse. Our design project combined state-of-the-art academic and instructional facilities with semi suite-style rooms for 96 students. The academic portion of the building houses classrooms and campus learning centers, an auditorium, and conference and collaboration spaces, which help make the building a 24/7 hub of activity. Reimagining outdated structures allows universities to utilize centrally located buildings, giving students the many benefits of flexible and functional spaces that meet current needs without having to travel to the campus edge. Many existing campus buildings have deep connections to a university’s culture that create sentimental ties to students and alumni. Some are listed within historic districts or are part of a campus historic preservation plan and cannot be removed. Re-envisioning these structures becomes a mandate, although this mandate does not have to be a burden. A practical approach is needed when repurposing an existing building while preserving the building’s original essence. Georgia College & State University’s Ennis Hall, a former residence hall built in 1918 and located in the campus’ historic district, is a prime example. Our team restored the building’s exterior and retained the building’s historic, double-loaded interior corridors to laud the familiar. 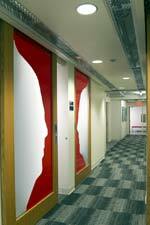 The design brought the building into the future by opening the walls along the corridor and between former dorm rooms to create large, open spaces for art classrooms, studios, and galleries. By restoring historic details, we ensure that the building’s original history is celebrated as its purpose shifts. Alumni, students, and visitors will notice a successful preservation effort, which hopefully adds tangible value from boosted alumni contributions. Effective historic and urban fabric projects often earn preservation or urban design awards, and Ennis Hall has won awards from the Georgia Trust for Historic Preservation, the Society for College and University Planning (SCUP), and the International Interior Design Association (IIDA). Lastly, since many colleges and universities were founded during land grant and post-war booms, they often become landlocked by surrounding development over time. This causes institutions to look within when new spaces are needed. Such was the case at Duke University, where we adapted a well-located former café that no longer met student expectations into an innovative makerspace and lab called the POD. Located within the Levine Science Center, the POD’s central location and abundant windows showcase the engineering program and ensure the space remains a 24-hour learning and collaborative hub for freshman students of Duke’s Pratt School of Engineering. At Lord Aeck Sargent, our team has developed strategies to optimize successful re-envisioning of campus buildings. Several factors and approaches are essential to effectively integrate a new use and transform an aging and outdated building. Analyze client responses to questions such as: What is this building good for? In this location, what is the best use? What do you want to achieve with your building, not only functionally, but in spirit and how it connects to the rest of campus? Then apply the questions of practicality and efficiency to the goals for the space: What moves will yield the greatest impact? What is feasible here? The answers provide the foundation needed for design suggestions when reaching out to faculty, students, and stakeholders through feasibility studies. Gather information and assess the campus’s unique needs that will be filled in that specific space. Take a comprehensive look at the bones of the building – its structure and construction, location and geometry – and combine findings with test-fits of the desired function within the existing structure. Appropriate fit and a creative approach to fitting the new program into the old building’s framework is essential to a practical, feasible, and economical outcome. Communicating with all stakeholders on campus is essential to achieving campus-wide buy-in. Meet with faculty and students to absorb their perspectives of campus learning practices and social interactions. Allow the general campus population to participate in the design of the structure through questionnaires and surveys or town hall meetings. Stakeholder interviews and discussions provide information about specific functions, design, and cost priorities of the building. This comprehensive approach uncovers the needs, desires, and gaps present on campus, resulting in a project that satisfies administration and all end users. Some see repurposing existing buildings as limiting and lackluster compared to the blank canvas of new construction, but these projects exemplify the magic that happens when architects are challenged to capture the essence, character, and value of an existing building while designing a space that is flexible and sustainable for future use. In fact, we have seen that imposed boundaries provide the framework to be more creative, responsive, and sustainable – the cornerstones for the best kind of design. Deborah Fritz, AIA, LEED AP, CDT, and Rebecca McDuffie are senior associates at Lord Aeck Sargent, a Katerra company, an award-winning architecture, planning, landscape architecture, and interior design firm serving clients in the college and university, K-12 education, multi-family housing/mixed-use/commercial, and urban design/planning markets with specialization in science and technology, arts and culture, multifamily housing, and historic preservation. Fritz and McDuffie have a combined 56 years of experience and 25 projects involving repurposing existing buildings to exceed expectations for future use. ©Rion Rizzo / Creative Sources Photography, Inc.